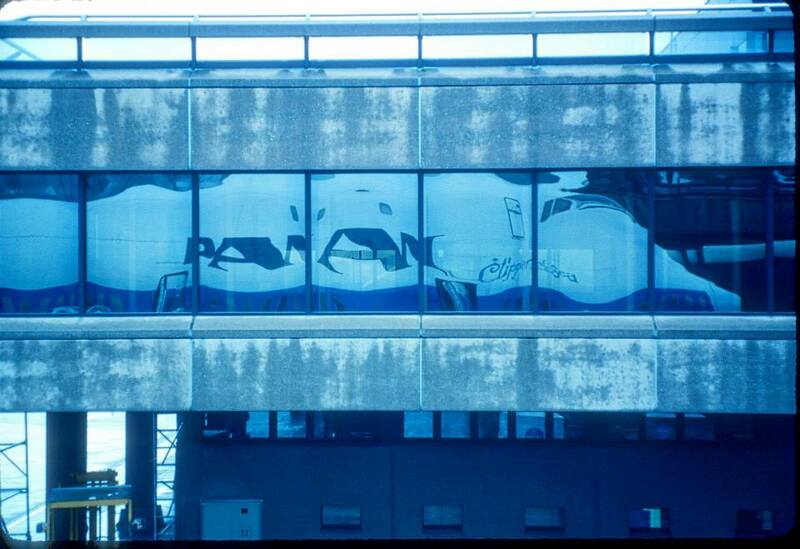 THE LAST WEEK OF OCTOBER IS SIGNIFICANT IN THE HISTORY OF Pan American World Airways. Looking at the last six days of the month, the first Amazon route service was established on the 25th in 1933. On the 26th was the first service to Buenos Aires in 1931. On the 28th was Pan Am’s first scheduled flight in 1927. And on the 29th was the first operation at Pan American Field in Miami in 1928. There were two more recent events: On the 26th was the inauguration of the first scheduled trans-Atlantic service with an American-built jet, a Boeing 707-121 in 1958, the subject of this article, and on the 28th was the record-breaking Pole-to-Pole round-the-world flight with a Boeing 747SP in 1977, commemorating the fiftieth anniversary of Pan Am’s first scheduled flight, to be covered next week. During World War II, Pan Am President Juan Trippe, Charles Lindbergh and Pan Am Chief Engineer Andre Priester explored the idea of jet propulsion. However, the idea that jets would eventually become commercially viable did not have its genesis until the early 1950’s. Then, there was no jet airliner even in the design stage in the United States. Britain had been developing the “Comet” jet, but it lacked range. Boeing was developing a bomber, called the B-47, but its design did not lend itself to commercial flight. In December 1951, BOAC (predecessor to British Airways) took delivery of its first Comet, notwithstanding its poor economy and range. 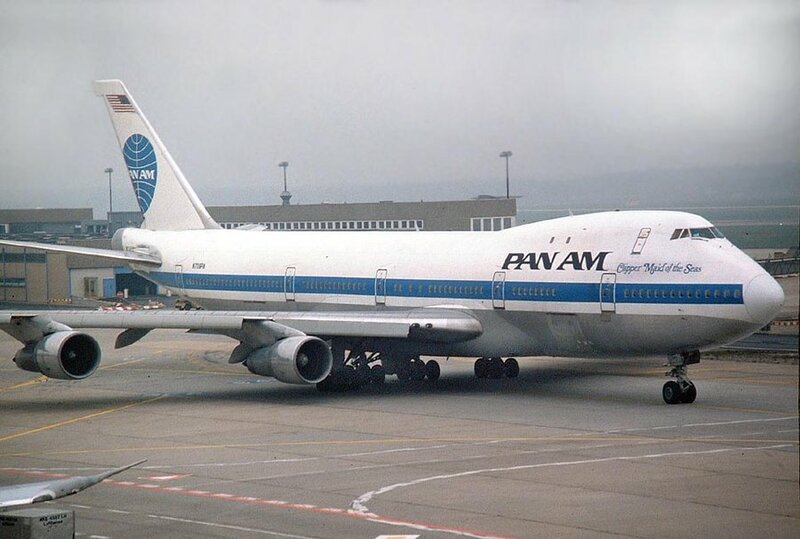 What Pan Am wanted was a plane that could carry at least 65 passengers from New York to London at 500 miles-per-hour. In mid-1952 Pan Am engineers Priester and John Borger made the rounds to Boeing, Douglas and Lockheed. What was seen was disappointing. The manufacturers, however, soon began focusing on a commercial jet because by September 1952, jet airliners had become inevitable. Boeing developed the Boeing 707 prototype and Douglas was working on its DC-8 project. At the same time, the turboprop engine had been developed and airlines were lining up for the likes of the Lockheed Electras and British Viscounts. Pan Am was not in the line because its engineers were of the opinion that propellers were the cause of most mechanical breakdowns. BOAC indicated its intent to start trans-Atlantic operations with the Comet jet, even though its range required two stops westbound and one stop eastbound. Despite that, it was still 3-5 hours faster than the comfortable Startocruiser that Pan Am was using on its trans-Atlantic routes. 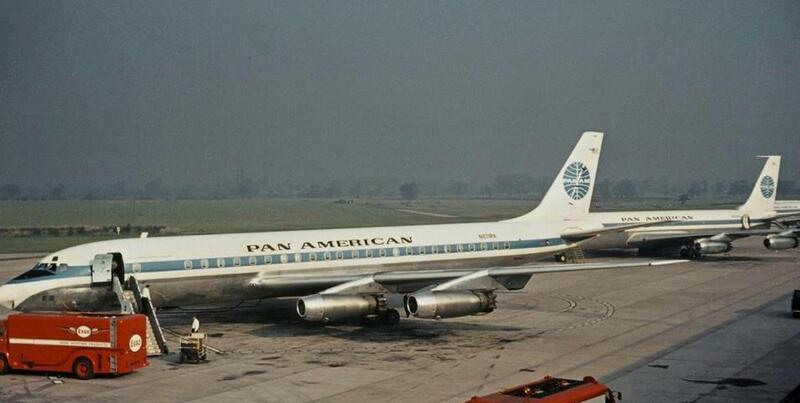 To play it safe, Pan Am ordered three Comets although doubtful they would ever be delivered. They were not. After a number of accidents it was determined the Comet had a design flaw that required its grounding. This page from a 1959 timetable (above) demonstrates the extent of Economy (“Clipper Thrift”) class service on trans-Atlantic flights. Every flight offered it. Tourist (“Rainbow”) service was only available on a handful of flights. It should be noted, however, that Rainbow (and not Economy) service was available on all flights beyond the UK and European gateway cities, probably due to limitations in the bilateral agreements between the US and the countries concerned. Deluxe “President Special” service was only available on jets. The other aircraft used on the trans-Atlantic routes was the DC-7C with a change of gauge to DC-6Bs once “over the pond”. One interesting note is that some flights offered three-class service: First, Tourist and Economy. 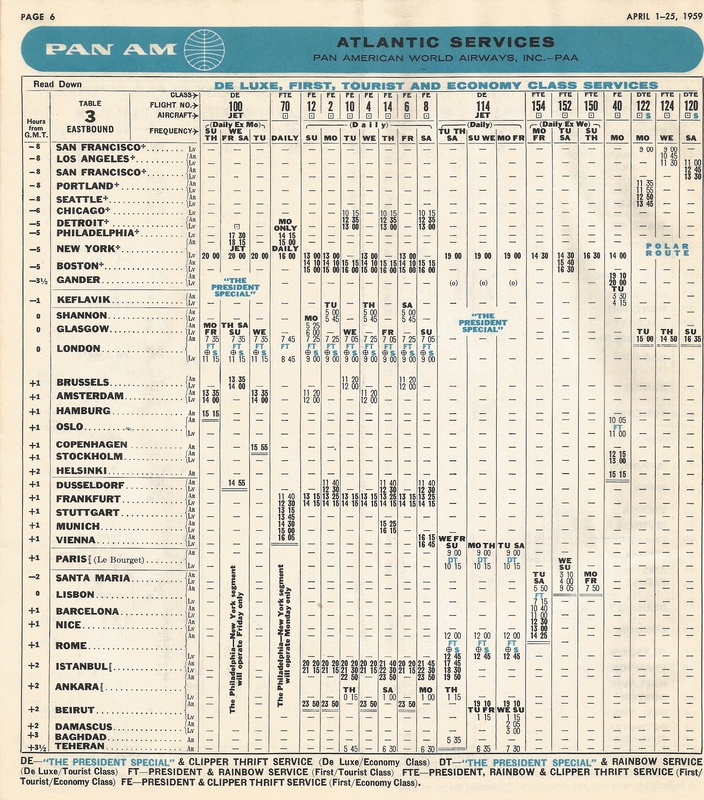 Pan Am’s first scheduled jet flight was No. 114 from New York to Paris on 26 October 1958. The flight was operated with the smaller 707-121 and required a fuel stop in Gander along the way. “Also unlike conventional airplanes that lift off the runway in a horizontal attitude, jets do it nose up. No one has given us prior warning of this characteristic either. As we attain take-off speed approaching 200 mph, Captain Miller rotates the nose of the Clipper sharply upward. This causes us, seated in the very tail of the jet, to drop sharply downward—a sensation I would never become totally comfortable with. We are airborne! 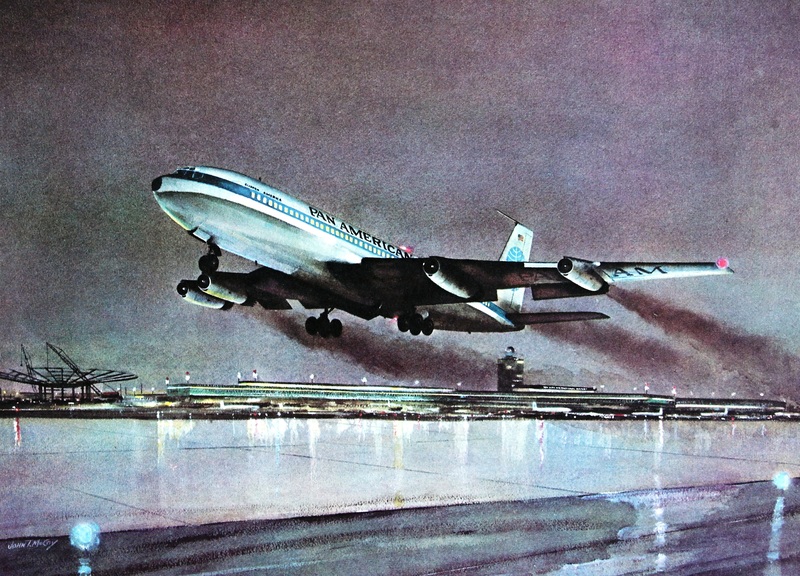 John T. McCoy watercolor of the takeoff of Flight 114. 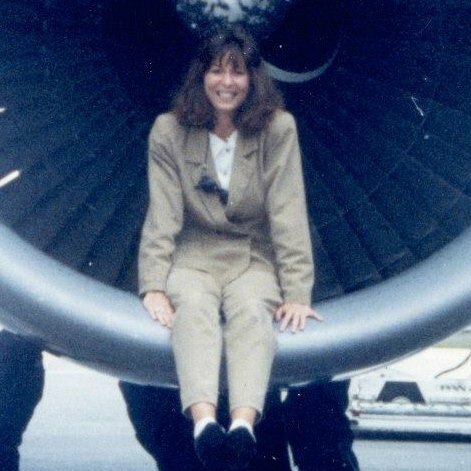 The introduction of jet service changed the travel industry forever. Slowly, trans-Atlantic travel by passenger steamship as a mode of transportation (as opposed to cruising or pleasure) disappeared. Similarly did long-haul rail service in the United States. Because of the jet, more places are available to more people than anytime in history. What Juan Trippe envisioned some 80 years ago not only has become a reality, but also a part of the life we live today. Jay Koren’s story about his first flight on Pan Am jets is one of 71 stories in Pan American World Airways – Aviation history Through the Words of its People written by the people of Pan Am who played important roles in many of the important events in Pan Am’s history. The book is published by BlueWaterPress.